The ICO Prize for 2006 is won by Dr Hideyuki Sotobayashi of Japan. Dr Hideyuki Sotobayashi, a senior scientist at the National Institute of Information and Communications Technology, Japan. The proposal of the ICO Prize Committee for the year 2006 has been to deliver it to Dr. Hideyuki Sotobayashi, a Senior Researcher at the Advanced Communications Technology Group, National Institute of Information and Communications Technology (NICT) in Japan. This proposal was unanimously approved by the ICO Bureau held in Saint Petersburg (Russia) last September 2006. The award citation reads: "The ICO Prize for the year 2006 is given to Dr. Hideyuki Sotobayashi in recognition of his outstanding contributions in the areas of optics communications, optical fiber technologies and new photonic devices. These achievements were done as a researcher younger than 40 years old (as per December 31, 2006)". 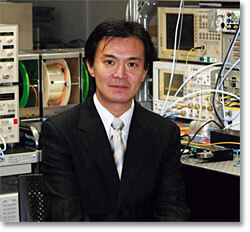 Hideyuki Sotobayashi received his PhD in electrical engineering in 1997 at the University of Tokyo. He then was engaged as an attached researcher at the NICT and is currently a senior scientist in the same institution inside the Advanced Communications Technology Group in Tokyo (Japan). Also, he is a researcher affiliated at the Research Laboratory of Electronics, Massachusetts Institute of Technology (MIT), United States of America. His research interests include fiber lasers, highly nonlinear optical fibers for supercontinuum generation, nano-scale photonic crystal microcavities, broad-band optical amplifiers based upon optical fibers, optical code division multiplexing (OCDM) transmission systems and ultrafast hierarchical hybrid OCDM/Wavelength Demultiplexing (WDM) photonic, devices. Among these research activities and achievements, one should mention that in 2002 Hideyuki Sotobatashi and two other collaborators in Japan were proposing a photonic gateway performing the bilateral conversion and reconversion of multiplexing format and operating at 40-Gb/s (4/spl times/10 Gb/s). The optical OCDM-to-WDM conversion and WDMO-to-CDM reconversion was experimentally demonstrated for the first time. The experimental scheme was based upon ultrafast photonic processing both in the time domain and frequency domain, namely, optical encoding/decoding along with optical time-gating in the time domain and supercontinuum generation followed by spectrum slicing in the frequency domain. Thus, they were demonstrating the feasibility of ultra-high-speed operation features in photonic networks. Moreover, Hideyuki Sotobayashi has reviewed the very current photonics devices for redesigning with simplified configurations. Thus, he has significantly contributed to improve the performances of key technologies for hierarchical Optical Time Domain (OTDM)/WDM multiplexing format conversions, and OTDM wavelength-band conversion networks. Hideyuki Sotobayashi has authored or co-authored more than 60 peer reviewed articles in international journals. He has been invited to various international conferences, has received many distinctions and awards, to mention for example the 1999 Young Engineer Award from the Institute of Electronic and Communication Engineers of Japan and the recent 2005 Young Scientist Award from the Ministry of Education, Culture, Sports, Science, and Technology of Japan. He holds one awarded patent. He is also very active in various professional societies in the area of optics, photonics and electrical engineering and has participated in many scientific committees and tutorials in the area of photonics and optics communications technologies in the recent past years. With the contributions of Hideyuki Sotobatashi it is nowadays demonstrated that the optical transmission technologies are dramatically progressing. The future of photonic networks seems to be very promising and will allow performing routing and switching in the optical layer by use of ultrafast photonic processing. It is expected that Hideyuki Sotobayashi will deliver an invited plenary lecture at one of the forthcoming major ICO Topical Meetings, and where the corresponding award ceremony will take place as well. This event will be announced in due time. Prof. Mohammed M Shabat wins the ICO Galileo Galilei Award 2006 for his many contributions to optics and photonics. 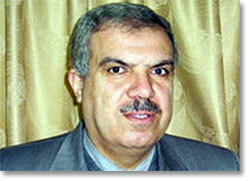 Prof. Mohammed M Shabat, a professor of physics at the Islamic University of Gaza, Palestine. Prof. Shabat presenting at the 9th International Symposium on Microwave and Optical Technology. Undergraduate students at work in the IUG laboratory for electronics. The Galileo Galilei medal of ICO was established in 1993 to recognize outstanding contributions to the field of optics which are achieved under comparatively unfavorable circumstances. The outstanding contributions in the field of optics should refer to fundamental scientific questions or problems, or research or development of optical methods or devices, or scientific or technical leadership in the establishment of regional optical centers. The "comparatively unfavorable circumstances" refers to difficult economic or social conditions or lack of access to scientific or technical facilities or sources of information. For the year 2006 the recipient of the award is Prof. Mohammed M. Shabat from the Islamic University of Gaza (IUG), Gaza Strip (Palestine). The citation of the award reads: "For his outstanding scientific contributions in the area of theoretical and electromagnetic optics, which were accomplished under comparative unfavorable circumstances as defined on the award call and for his relevant work for the organization of optics and photonics activities in Palestine". Mohammed M. Shabat, was born in Beit Hanoun, Gaza Strip, Palestine in 1960. He received his B.Sc. in Physics from Al-Aazhar University, Cairo, Egypt in 1984 and the Ph.D. degree from the University of Salford, U.K. in 1990. He was a Research Fellow at the University of Manchester Institute of Science and Technology, UK, from 1989 to1992. In April 1992, he joined the IUG as an Assistant Professor of physics. The IUG is the first higher education institution to be established in Gaza Strip. The Faculty of Science at IUG is one of the pioneering faculties in Palestine. It is established to meet the needs of specialities and scientific research in different fields and to provide students with the latest ever-achieved in science and technology. In 1996 M. Shabat became an Associate Professor and a Professor of Physics in 2000. In the period 1993-1997, he was the Dean, Faculty of Science, and in the period 2001-2005, he was the Vice President for Administrative Affairs at IUG. He was awarded the Shoman Prize for a Young Arab Scientist (Jordan) in 1995, and the Humboldt Research Fellowships in 1998-99 at the Center of Semiconductor Technology and Optoelectronics, Duisburg-Essen University, Germany. Since 1994 M. Shabat has been a visiting scientist in various institutes, universities and research laboratories: Bochum University, Germany; the Institute National Polytechnic de Grenoble, (INPG), France; Salford University, U.K; International Center for Theoretical Physics (CTP), Trieste, Italy and Duisburg-Essen University, Germany among the most significant to his carrier. He is currently visiting scientist in Max Planck Institute for the Physics of Complex Systems, Dresden, Germany. He has published more than 140 papers in international journals and presented many contributions at local and international conferences. His research interests include non-linear optical sensor, opto-electronics, magneto static surface waves, numerical techniques, mesoscopic systems, energy physics, applied mathematics, nanotechnology and physics education. Mohammed Shabat is very devoted to his students. He has supervised more than 20 postgraduate students (M.Sc and PhD) in physics and mathematics. Recently he has established a Palestinian Optical Society (POS). In relation to the development of new education programs he has been an active member of Scientific Committees for establishing new programs at IUG (Master program in mathematics, in physics, and in electrical engineering, BSc., programs in Computer Science, environmental sciences, and optometry). He was also a member of the Editorial Board of the IEEE Transaction on Magnetism from 1996-97. 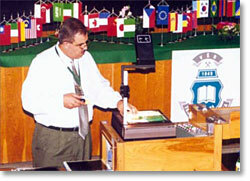 Mohammed Shabat has been very active in the international projection of Palestinian science. In 1997, he became associate Member of the ICTP. He was member of Palestinian delegation to the 44th meeting of the International Atomic Energy Agency (IAEA), Vienna, Austria, September 2000. In 2003, he became a Senior member of IEEE (the Institute of Electrical and Electronic Engineer). In 2003, he also was selected member of the Steering Committee of World Renewable Energy Congress and World Renewable Energy Networks, U.K. Prof. Shabat was elected in 2004 fellow of the Academy of Sciences for the Developing Countries (TWAS). He has been a committee member of the Shoman Prize for the Arab Young Researcher in 2006. He is member of the Palestinian Physical Society and the Palestinian Society for Mathematics and Computer Sciences. He is also a Fellow of Palestinian Academy of Sciences. He is member of the Palestinian National Committee of Ministry for Higher Education for Science, Technology and Research. Professor Shabat is the first scientist from the Arab World winning the Galileo Galilei Award since its establishment in 1993. The Galileo Galilei Award 2006 ceremony will be held during the period 2007-2008 and it will be followed by the plenary lecture delivered by Mohammed M. Shabat in one of the ICO major conferences in that period. The related information will be publicized on due time in issues of the ICO Newsletter and ICO website. The Bureau approves actions to develop ICO at a two-day meeting in St Petersburg. The ICO Bureau. First row from left to right: M L Calvo, A T Friberg, G von Bally, R Dándliker and A Sawchuk. 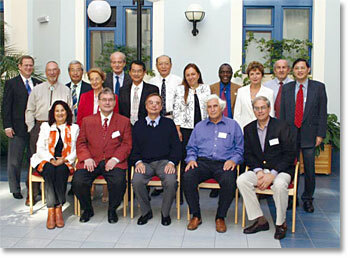 Second row (from left to right): P Stahl, G Sincerbox, I Yamaguchi, A Consortini, H Lefèvre, B Y Kim, G Jin, A Guzmán, A Wagué, M Kujawinska, Y Pettrof and M Gu. ICO Bureau meets once every year to discuss and to update all the current programs that ICO has under development and to analyze the possible further activities to be proposed and considered. When the year coincides with the celebration of the General Conference and General Assembly, the Bureau meets in the place were the meeting is held. In addition to these special dates, the Bureau meets usually at the occasion of major ICO meetings. This year, and in coincidence with the ICO Topical Meeting on Optoinformatics/Information Photonics 2006, the ICO Bureau had its meeting in Saint Petersburg. It was a two days meeting held at the Research Institute of Optoinformatics of the Saint Petersburg State University of Information technologies, Mechanics and Optics (ITMO). The ICO is recognizing the warm hospitality and all the technical support provided by ITMO academic authorities for the meeting to be a success. Moreover, Prof. Nikolay Nikonorov, Director of the Research Institute of Optoinformatics was presenting a resume of activities and research lines developed at the Institute, with details on research on optical materials, GRIN media and 3D holography. As a resume, among some of the approved actions ICO will apply dedication to increase its presence in ICSU activities, to enhance the links with industry, to coordinate activities in the areas of optics and photonics with international societies for education and training, and some other actions related to the coordination of the internal organization and the Territorial Committees. Detailed information will be contained on the corresponding Green Book edited by ICO Secretariat at the end of term 2005-2008. The next ICO Bureau meeting will be held in Cape Coast, (Ghana) at the occasion of the ICO Topical Meeting 2007 on Optics and Laser Applications in Medicine and Environmental Monitoring for Sustainable Development in November 2007. A detailed report on the ICO Topical meeting on Optoinformatics/Information Photonics 2006 will appear on the forthcoming issue of ICO Newsletter, April 2007. A Cuban researcher visits Mexico under ICO's Travelling Lecturer Programme. Dr Fájer delivering a lecture at CINVESTAV, the National Polytechnic Institute, in Mérida in Mexico. 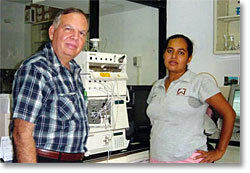 Dr Víctor Fájer with researcher I Martínez-Rodríguez at the Laboratory of Chromatography, Mazatlán Research Station on Aquaculture and Environmental Management. From August 19 to September 9, 2006, Dr. Víctor Fájer, a researcher from the Center of Technological Applications and Nuclear Development, La Havana (Cuba) performed a visit to different Mexican institutions under the ICO Traveling Lecturer Program. These institutions have shown an interest on the current development of laser systems and its applications with analytical purposes constructed in Cuba. The visit included the Federal District and the Sinaloa and Yucatán states. The performed conferences were oriented to design aspects, development of optical instruments and its applications and to promote the collaboration in the region. The first lecture entitled ¨New developments of laser polarimeters and its applications¨ was given in the Center of Applied Sciences and Technological Development (CCADET) receiving the valuable collaboration of Dr. Roberto Ortega. During the visit exchanges with researchers and visit to the laboratories took place. This institution, belonging to the National Autonomous Metropolitan University of México (UNAM), is oriented to the development of methods and techniques employing optics, electronics and mechanics. It has an infrastructure of optical laboratories which allow to perform experimental studies of non linear optics, optical fibers and other topics connected with lasers. The next visit took place in the Center of Aquiculture and Environment Management (CIAD), Mazatlán Unity. In it the seminar ¨Polarimetric and chromatographic techniques employing lasers for vegetable extracts¨, was delivered oriented mainly to potential users of the laser systems and to promote different applications. This visit was performed with the collaboration of the director of the Center, Dr. María Cristina Chávez. He visited the analytical laboratory, which has good chromatographic equipments. As a result, an agreement was made in order to promote these techniques in similar units like the Culiacán one which analyzes agricultural products. The third exchange was realized in the Research Centre of Advanced Studies of National Polytechnic Institute, Mérida Unity, organized by Dr. Rodrigo Patiño. Various visits to different laboratories including those belonging to the Applied Physics Department took place as well. This department was opened in 1987 and at present has 28 lecturers belonging to the National Research System. Its research areas include corrosion, electrochemistry, physics, and chemistry of materials, condensed matter, complex systems, statistics, non linear physics, elementary particle physics and life matter among others. 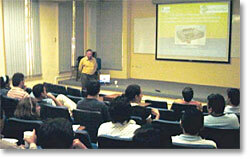 It was devolved a seminar entitled ¨Design criteria of automatic polarimeters. Influence of the spectral bandwidth in the polarimetric measurements¨ in the same there was an active participation of researchers, technicians and students from the Mérida CINVESTAV. During the meeting there were identified collaboration interests for the application of laser systems which could be attended by the performance of a Collaboration Agreement between the Mérida CINVESTAV and the Center of Technological Applications and Nuclear Development of Cuba. All the above mentioned institutions showed their interest in the promotion of the applications and developments of laser systems in the Latin-American region.